Development of the Curtiss SC Seahawk began in June 1942, when the US Navy requested the company to submit proposals for an advanced wheel/float scout aircraft. The easily convertible landing gear configuration was required so that the aircraft could be operated from aircraft carriers and land bases, or be catapulted from battleships, and the type was required to replace the rather similar Curtiss Seamew and Vought Kingfisher which stemmed from 1937 procurements to satisfy a similar role. The Curtiss Model 97 design proposal was submitted on 1 August 1942 but it was not until 31 March 1943 that a contract for two XSC-1 (Model 97A) prototypes was issued. An all-metal cantilever low-wing monoplane, the SC Seahawk had fold-able wings with considerable dihedral on their outer panels and strut-mounted wingtip stabiliser floats. The central float, which could also accommodate some auxiliary fuel, and the main wheeled landing gear units shared common attachment points. Power was provided by a Wright R-1820-62 Cyclone 9 radial engine. The first prototype made its maiden flight on 16 February 1944, and was followed by 500 production SC-1 (Model 97B) aircraft which had been contracted in June 1943. All were delivered as land-planes, the stabiliser floats and Edo central float being purchased separately and installed as and when required by the US Navy. Delivery of production aircraft began in October 1944, the first equipping units aboard the USS Guam. A second batch of 450 SC-1s was contracted, but of these only 66 had been delivered before contract cancellation at VJ-Day. An improved version" was developed, changes including the installation of a 1063kW R-1820-76 engine, provision of a clear blown canopy, and a jump seat behind the pilot. 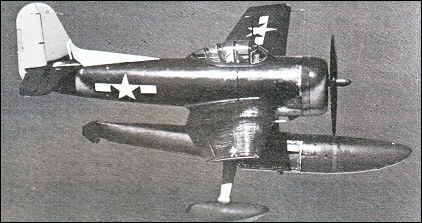 The modified prototype, at first designated XSC-1A and then XSC-2 (Model 97C), led to receipt of a contract for similar production SC-2 (Model 97D), but only 10 had been delivered by the war's end. My father was on the USS Tangier AV-8. It was a Sea Plane Tender. In one of the photos it shows them recovering a PBY. These were the planes carried by the USS Missouri when it sailed into Tokyo Bay for the surrender ceremonies ending WW2. Seahawk was a first class float plane. Often wondered why Curtiss never offered the P36/Hawk 75 to the navy as well as other countries in that configuration. SC-1 Both crashed and replaced by helicopter ca 1948.
off after July 4, 1947 in Yokosuka, Japan, Tokyo Bay] Ensign Grayzan crashed both SC-1, excellent pilot, just bad luck. know if any them are in museums if so where? Can anyone out there give me the identities/photos of the two Curtiss Seahawks on the USS Houston when she made a "Goodwill Tour" of Europe in 1946 and visited many ports including Lisbon, Southampton etc. She visited Glasgow, Scotland on 18th October 1946. On show was a Seahawk marked "The Outlaw" with a sketch of Jane Russell on the engine cowling. Surely somebody out there can help on this? Just found the site looked up the SC-1 that is usually omitted in the compendiums of aircraft but congrats it is here. my dad operated the SC-1 as the senior Naval Aviator on the USS Chicago heavy Cruiser in WW2. participated in the bombardmant of the japanees mainland. Not sure the dates. Aboard the USS Atlanta CL-104 in 1946, I maintained and repaired an APS-15 Radar set mounted under an SC-1 wing. An aircraft that I find attractive, too - closely similar to the Japanese floatplane fighters. By 1942, however, the scout requirement had gone beyond the capability of a floatplane. The Nakajima C5N or the Fairey Firefly were more along the lines of what was needed, depending on whether a pure recon or a multimission platform was desired. The R-2800 would provide a basis for a satisfactory aircraft of either sort. By that time, the floatplane function was shrinking to gunfire spotting, ASW patrol, and air-sea rescue. None of them required such a performance, but the rescue mission could use more accomodation. This is cool, YOU were the 1st to put the Seahawk into combat? Sir, it's an honor! Hey, are any of these puppies in museums anywhere? I just spent the longest time reading a site about seaplanes. I like the lines on it, a tad sleek, but stylish. Like a cross between a bearcat and P-47. I'm the first pilot to put this aircraft into combat in june of 1945.